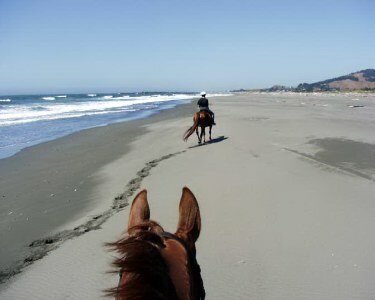 In August, 2003, Lynne and I went to Gold Beach, Oregon with Wing It and Eiswein to go riding on the beaches and also take lessons from Melissa Simms, of Rohnert Park, California. Ms. Simms was invited to Gold Beach to give Dressage lessons to some of the local riders and we were permitted to join the group. We met some wonderful people, had some wonderful times -- and just may be the only people to visit Gold Beach and NOT spend any time on a boat fishing or Jet Boating the Rogue River. We kept our horses at the Curry County Fairgrounds ($106 boarding fee for the two horses for the week) which has direct access to the beach. We stayed at the Shore Cliff Inn ($85/night for an ocean view room with kitchenette & free local calls) that was two doors down from the Fairgrounds. And, very important to us, the local ISP, WaveNet, provided unlimited dial-up access for the week for $9.95! You can contact us via email at peter@tsandm.com.